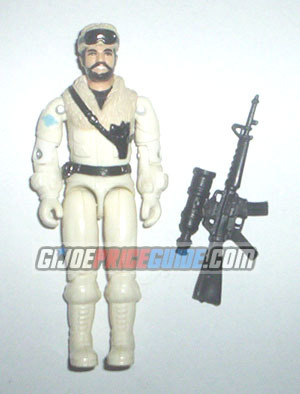 NOTES: Although the 1985 Frostbite doesn't seem to have nearly as much of a yellowing problem as the 1983 Snow Job or 1984 Storm Shadow, there is often black paint damage, especially to his black goggles. The blue insignia on his right arm is often damaged as well. But the Snow Cat was a popular vehicle, so Frostbites are plentiful.